Cement backer board is an inexpensive, convenient building material that makes tiling, flooring, and countertop projects go faster and look better in the end. Most importantly, cement backer board contributes to a longer lasting, more durable tile installation, with no chance of backing board rot and a reduced chance of rot with the underlying wall studs or floor joists. Cement backer board is a mineral-based product, usually 1/4-inch or 1/2-inch thick and 3 feet by 5 feet long, commonly used to form a base for ceramic tile. Also called a cementious backer unit or CBU, backer board is 100-percent inorganic, consisting of cement, water, silica, limestone flour, and fibers such as Kevlar or fiberglass for strength. Unlike wood-based materials such as plywood or products that contain some wood such as drywall, cement board lacks the organic matter that will promote mold, rot, shrinkage, or decomposition. Because cement backer board is porous, thinset, grout, and mortar adhere well to it. Backer boards can be nailed or screwed into studs or into cinderblock, brick mortar, or concrete. Boards can be easily cut with a hand saw, circular saw, jigsaw, or multi-tool. To understand the value of cement backer board, consider another pre-fabricated wall unit: drywall. For years, interior walls were finished with wood strips (lath) laid over wall studs. Plasterers then troweled on plaster and waited weeks for it to fully dry. In 1916, United States Gypsum developed the idea of doing all of that drying in a factory, thus the name drywall. All of that plaster and the structural qualities of the lath were pressed and dried ahead of time in a factory, in the form of sheets called Sackett Wall Board. Think of cement backer board as a tile-appropriate equivalent of wall board. Instead of workers floating massive beds of mortar on the job site, mortar beds are created in a factory and milled into thin standardized sizes. Due to cement board's strengthening additives, these sheets are far stronger and more dimensionally stable than site-built mortar beds. Most significant, though, is the reduction of on-site drying time, as cement backer board is dried in the factory. Flooring: 1/4-inch, 1/2-inch, or 5/8-inch thick backer board. Use 5/8-inch exterior-grade OSB or plywood as a base. Countertops: 1/4-inch, 1/2-inch, or 5/8-inch thick backer board. Use 3/4-inch exterior-grade plywood as a base. Walls and Ceilings: 1/2-inch or 5/8-inch thick backer board. Apply directly to the wall studs or joists, with each spaced at a maximum of 16 inches on-center. Ceramic or porcelain tile, with its seams and numerous avenues for moisture infiltration, can eventually lead to its base material contacting with water. Once this happens, the studs can begin to dampen. Mold, mildew, and rot result. In short, tile and grout are not inherently waterproof. Wood is not an acceptable material to use for places with constant water usage such as showers and bathtubs. Regular drywall is not appropriate. 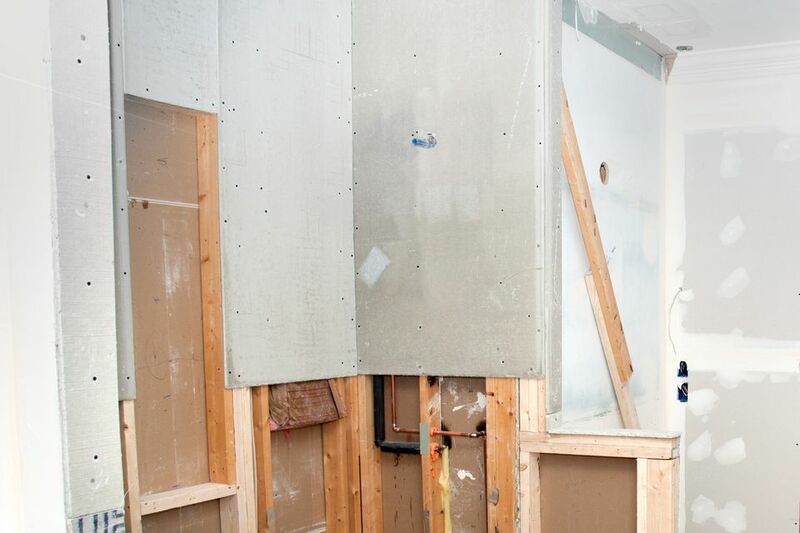 Many professional installers even recommend against using water- or mold-resistant drywall in high-moisture areas. In sharp contrast, cement backer board does not rot, warp, grow mold, or deteriorate when subjected to water. Cement backer board is mainly used as a sub-surface for tiling. Cement backer board is often used as a tile base on plywood or OSB subfloor. Cement backer board on concrete as a subfloor or underlayment is usually not recommended or needed. In most cases, you can apply tile directly to the concrete. Manufactured veneer stone is another use for cement backer board. Veneer stone cannot be applied directly to drywall or other materials that will draw in moisture from the mortar. Not only that, drywall is not a strong enough material to support veneer stone's considerable weight. One solution is to nail cement backer board CBUs over the drywall, tape the seams, and then grout over the cement backer board. If you have any obstructions to work around, before laying down the boards cut the cement backer board with a jigsaw fitted with a carbide blade. Apply thinset mortar on the underlying surface and comb it out with your trowel. Keep the cement backer boards about 1/4-inch apart. After pressing the boards into the mortar, screw them in with screws made especially for cement backer board installation. Just as you would with drywall, make sure the screwheads are slightly depressed below the cement backer board surface. Cover and mortar the seams with fiberglass seam tape. Durock: Made by USG, Durock vies with HardieBacker as being a favored cement backer board for tile workers and others who work in the building trades. HardieBacker: Made by James Hardie Industries, HardieBacker is 90-percent Portland cement and sand, with a patented MoldBlock additive. WonderBoard: Made by Custom Building Products, WonderBoard tends to be more flexible than Durock or HardieBacker, making it a better choice for curved surfaces.